On Friday, July 7th, we celebrate 18 fabulous years as Athlone Chiropractic Care. If you or anyone you know would like to come in for a spinal tune-up, all visits are 18 euro on Friday. Come by and reminisce or meet the team for the first time. If you have family or friends who have been talking about getting checked out but haven’t made the move, Friday is the day! New friends, older friends, baby friends, student friends, sporty friends… every visit is €18. 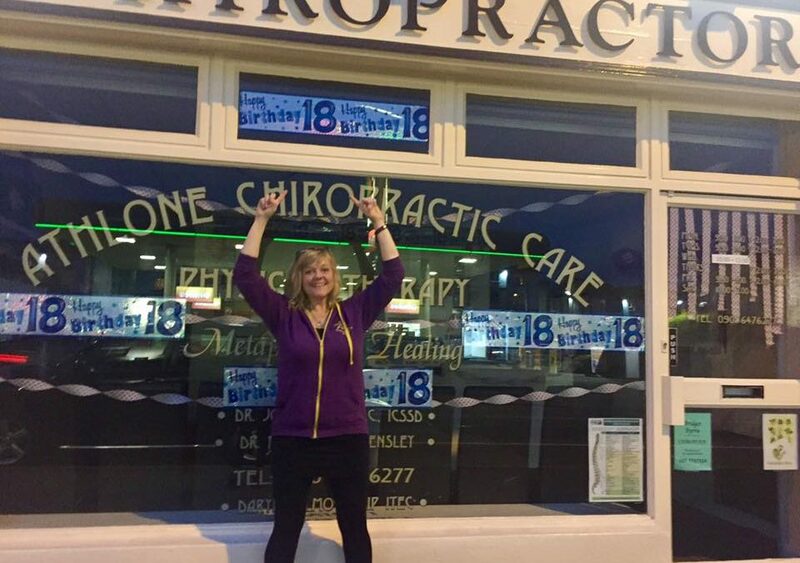 On Friday, July 7th, we celebrate 18 fabulous years as Athlone Chiropractic Care. If you or anyone you know would like to come in for a spinal tune-up, all visits are 18 euro on Friday. Come by and reminisce or meet the team for the first time. If you have family or friends who have been talking about getting checked out but haven't made the move, Friday is the day! New friends, older friends, baby friends, student friends, sporty friends... every visit is €18. Come celebrate with us and please tag folks and share this post so that someone you love can experience the life changing benefits of living with a spine free of interference!🎂🎂🎂🎂Ring Maureen at 09064 76277 to book in now!